Recycling of electric arc furnace (EAF) dust helps to avoid disposal of wastes, conserves resources, and minimizes its environmental impact. This study aimed to investigate the selective zinc removal from EAF dust by means of microwave heating oven as a heat source. The effect of microwave heating temperature on the selective zinc removal from EAF dust was studied at temperatures of 750 °C, 850 °C, and 950 °C. The mixture of EAF dust and graphite was well homogenized and compressed to pellet and heated for 20 min at the microwave power of 1.1 kW. X-ray diffraction (XRD), atomic absorption spectroscopy (AAS), and scanning electron microscope-energy dispersive X-ray spectroscopy (SEM–EDS) techniques were used to characterize the residue after microwave treatment. The results indicated that the reduction and the recovery of zinc increase with the rising temperatures. The temperature of 750 °C was insufficient for the volatilization of zinc. Zinc removal of 94% was achieved after microwave heating at 950 °C. The residue that remained in the crucible was composed mainly of metallic iron and calcium ferrite. These results indicated that a temperature of 950 °C is suitable for selective removal of zinc from EAF dust, which is in accordance with the thermodynamic calculations. Electric arc furnace (EAF) dust is a byproduct waste generated by the secondary steelmaking process in an electric arc furnace and considered as a hazardous material in most industrialized countries [1, 2]. However, EAF dust contains valuable metals such as iron, zinc, and chromium in addition to variable amounts of calcium, manganese, magnesium, and silicon . Zinc represents the major element of the EAF dust, and its value varies between 7 and 40 wt%, depending on scrap used, and the ratio of galvanized scrap utilized [4, 5, 6]. The reuse of the dusts is limited due to high Zn contents in the dusts. The presence of zinc causes operational problems when charged to a furnace, which affects the refractory materials, and thus decreases the productivities . There are two main processes for zinc removal from EAF dust: hydrometallurgical and pyrometallurgical methods. Furthermore, a combination of both methods may also be used. The prominent pyrometallurgical method for the recovery of zinc is the Waelz process. This process is based on a carbothermic reduction of zinc oxide and volatilization of metallic zinc . A high zinc recovery can be obtained from this method, but the high energy consumption is its major disadvantage [7, 8]. Hydrometallurgical processes are based on the leaching of zinc using both acidic and alkaline solutions, such as sulfuric acid , and hydrochloric acid. The main disadvantages of the leaching methods are the low zinc recovery, and the unwanted dissolution of iron [4, 8, 10]. 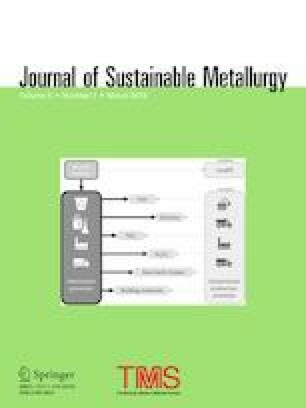 In the recently published work, the possibility of utilizing blast furnace sludge (BFS) to remove zinc from EAF dusts by means of microwave heating has been studied . The authors concluded that BFS can be applied effectively in the removal of zinc from EAF dusts owing to the excellent microwave absorption and high carbon content of the sludge. The present study examines the possibility of selective zinc removal from EAF dust by means of microwave heating. The application of microwaves as a heat source in material processing has become increasingly frequent over the last three decades [7, 12, 13, 14]. Compared to conventional heating, microwave heating offers several advantages such as selective heating, rapid heating, and volumetric heating [15, 16]. One way of metal separation from a metal oxide mixture is based on the selective reduction of one or more of the metal oxides, which are relatively unstable . The zinc oxide found in the EAF dust is less stable than iron oxide. The boiling point of zinc metal is 905 °C, which is lower than that of iron (2860 °C), and consequently the zinc oxide can be reduced, vaporized, and then collected in a separate phase from the gas . The standard Gibbs free energies for these reactions as a function of temperature are presented in Fig. 1. Temperatures at which the standard Gibbs free energies change from positive to negative values represent minimum temperatures at which the reduction reactions are thermodynamically possible when all the reactants and products are considered to exist in their standard states (i.e., as pure compounds). This assumption is justified for carbon, metallic iron, and zinc as well as all the oxides, whereas the gas components (i.e., carbon monoxide and gaseous zinc) can be assumed to be part of a gas mixture in which their partial pressures are less than one. Hence, by using the values presented in Fig. 1, it is possible to estimate the temperatures over which each reaction of pure compounds is spontaneous. As the partial pressures of the gas components appearing as products in reactions (1) to (5) decrease, the reactions become spontaneous at even lower temperatures than the ones presented in Fig. 1. It is seen from Fig. 1 that all the considered oxides (i.e., hematite, magnetite, wüstite, zinc oxide, and zinc ferrite) remain unreduced in the room temperature. When temperature is increased, reduction of hematite into magnetite, reduction of magnetite into wüstite, and eventually reduction of wüstite into metallic iron become spontaneous in approximately 100 °C, 700 °C and 750 °C, respectively. On the other hand, the reductions of zinc oxide and zinc ferrite into zinc become spontaneous at approximately 1050 °C and 1250 °C, respectively. The boiling point of zinc (907 °C) is also seen in the results, as zinc is reduced to gaseous form in temperatures above its boiling point as the driving forces being larger for the reactions (4b) and (5b) than for the reactions (4a) and (5a). Thus, above this temperature, the reduced iron remains solid, whereas the reduced zinc is in gaseous form and could be separated from the gas phase by cooling. The schematic diagram of the microwave apparatus is shown in Fig. 2. A single-mode microwave tube furnace with a magnetron with a frequency of 2.45 GHz and power of 1.1 kW was used in the experiments. Hundred gram sample was placed in a microwave transparent alumina crucible, which was positioned at the center of the microwave irradiation. The microwave cavity was insulated with alumina foil. At least two duplicate measurements were carried out for each sample. First, the microwave absorption abilities of raw EAF dust, EAF pellet, and graphite were measured at microwave power intensity of 1.1 kW. The temperature was continuously measured using a thermocouple. The zinc removal experiments were carried out at 750, 850 and 950 °C. The temperature of the sample during microwave heating was regulated using the controls of the power supply of the magnetron. Nitrogen was used to provide an inert atmosphere with flow rate of 0.2 L min−1. A pump was used to collect the evaporated zinc from the experiments. After the experiments, the samples were allowed to cool to room temperature in the microwave oven. Chemical composition of the residue in the crucible was analyzed to determine the rate of zinc removal. The experimental flowchart is shown in Fig. 3. The mixture of EAF dust and graphite was well homogenized with agate and mixer. The percentage of graphite in the mixtures was calculated according to the stoichiometric amount of carbon required to reduce all the zinc oxide (as both zincite and zinc ferrite) in the sample to elemental zinc and to reduce the iron oxide component of the ZnFe2O4 to iron metal. The ratio used in this study was 1.1 the stoichiometric amount (15 wt% graphite). A hydraulic oil press machine was used to compress the mixture at 200 kg f/cm2 for 1 min. The shape and the dimensions of the pellets used in this study are shown in Fig. 4. The chemical composition of the EAF dust was determined using a Bruker AXS S4 Pioneer X-ray fluorescence (XRF) spectrometer. 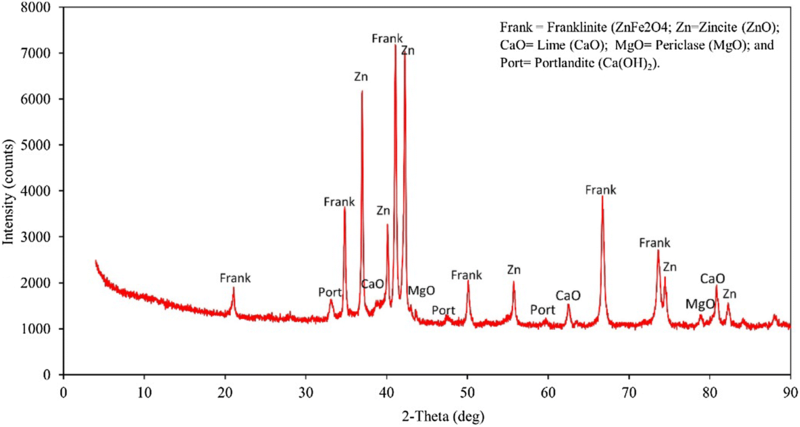 The zinc contents in the residues after the experiments were measured using atomic absorption spectroscopy (AAS). The elemental carbon content was determined using a LECO carbon analyzer. The mineralogical composition was measured using X-ray diffraction (XRD). The measurements were taken using a Rigaku diffractometer (D/Max 2200, Rigaku, Japan) with Co-Ka radiation and a nickel filter operated at a voltage of 35 kV and anode current of 20 mA. A field emission scanning electron microscope (FE-SEM) attached to an energy-dispersive X-ray spectroscopy (EDS) unit was used to investigate the residue after experiment. The SEM (XL30ESEM-TMP, Philips, Holland) was operated at 20 kV in low vacuum. Differential scanning calorimetry thermogravimetry (DSC-TG) and mass spectrometry (MS) was used to study the thermal behavior of EAF dust. The test was performed using a Netzsch STA409 PC Luxx. Approximately 23.84 mg of sample was placed in a platinum crucible on a pan of the microbalance at a heating rate of 10 °C min−1. The temperature range was 20–1400 °C. The identified phases in the EAF dust are shown in Fig. 5. The iron and zinc in the dust are presented as complex oxides with spinel structure and as metal oxide. 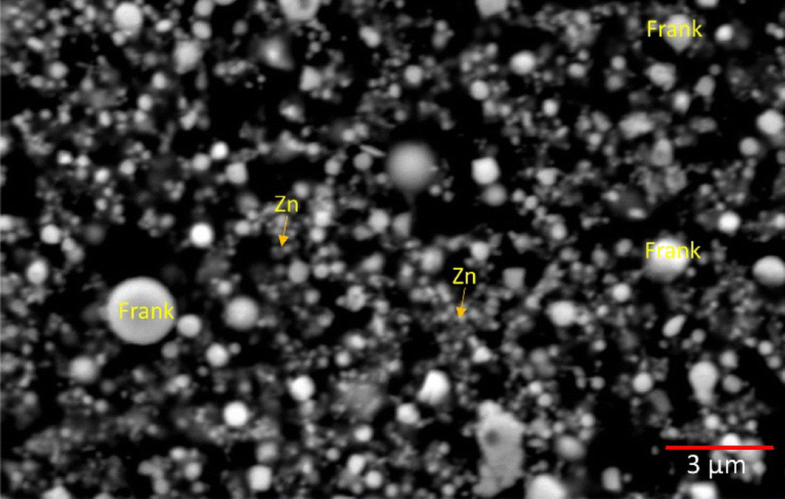 The main phases identified in the EAF dust are franklinite (ZnFe2O4) and zincite (ZnO). In addition to the main phases, portlandite Ca(OH)2, lime (CaO), and periclase (MgO) have been identified. 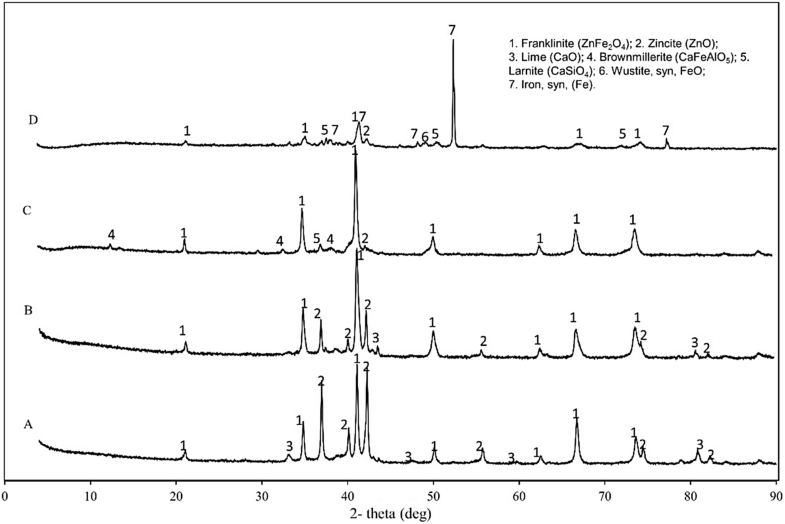 The dust also contained minor magnetite (Fe3O4), but the peaks of magnetite overlapped with the peaks of franklinite. SEM coupled with EDS was used for the identification of these phases; the results were published in a previous study . The chemical composition of EAF dust sample is shown in Table 1. The major elements of the dust were Zn, Fe, Ca, Si, Mg, and Mn. The concentrations of Zn and Fe in the dust are 35.76 and 23.50 wt%, respectively. The lime (CaO) content is 5.93 wt%. The carbon content is 1.5 wt%. The concentrations of Pb, Cl, and alkaline K2O are high in the dust. The contents of Pb, Cl, and K2O are 2.15, 1.69 and 3.21 wt%, respectively (Table 1). SEM image showed that EAF dust is characterized by spherical form, which is forming via vaporization and condensation during cooling . 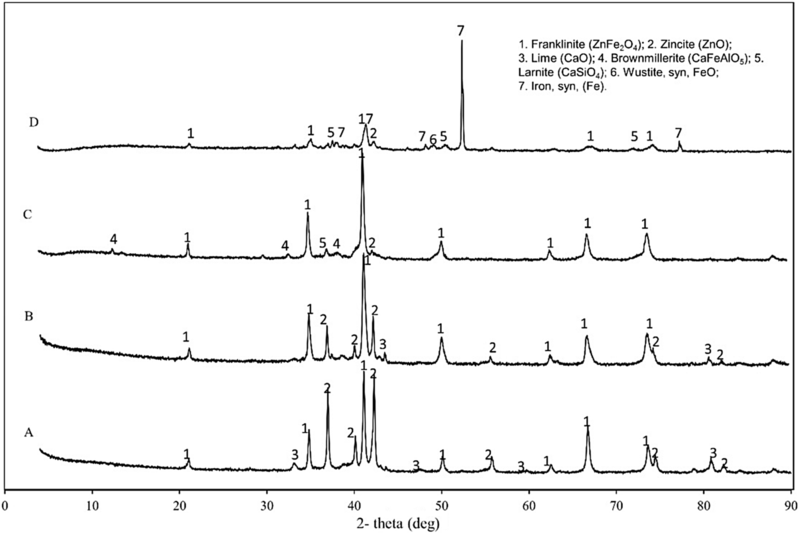 Franklinite and zincite spheres were identified in the EAF dust (Fig. 6). The median (d50) particle size for EAF dust is 1.63 μm. The thermal behavior of EAF dust under air atmosphere is shown in Fig. 7. The DSC-TG curves of EAF dust exhibited two main reactions at 400–450 °C and 560–650 °C (Fig. 7). These two reactions are related to the dehydroxylation of calcium hydroxide and the decomposition of calcium carbonate, respectively [2, 18, 19]. The weak reaction occurring in the temperature range of 500 °C associated with a slight weight gain is due to the oxidation of some free iron oxide to a higher oxidation state . The mass loss at the temperature above 900 °C is related to the volatilization of Zn and Pb [9, 18]. The carbon contained in the dust could react with zinc compounds, which evaporated into zinc vapor . The reaction at the high temperature of 1260 °C was due to the formation of calcium ferrite. The interaction of microwave with the studied materials is seen in Fig. 8 in which temperature changes of different materials are shown as a function of heating time. The heating profile shows that the temperature increased very rapidly at first after which its increase was slower. This change in the heating rates is due to the phase transformations in the materials during the microwave heating. The heating efficiency of microwaves depends on the material structure to which can be attributed the initial rapid increase in the temperature [20, 21]. The composition of the EAF dust changed during the microwave heating due to thermal decomposition of carbonates, zinc removal, and evolution of CO/CO2 gases. After microwave heating time of 180 s, a temperature of 756 °C was measured for the EAF dust. The good microwave heating properties of EAF dust is attributed to the contents of carbon and iron oxides, which are classified as excellent microwave absorbers [16, 22]. Table 2 gives the microwave heating properties of the mineral phases in the dust. Sun et al. indicated that EAF dust is an excellent microwave absorbing material. A temperature of 907 °C was reached when the EAF dust was heated for 5 min at 1.1 kw. Graphite was used as a reducing agent in this work. The graphite is heated up rapidly (hyperactive materials), and the heating curve shows that graphite is heated easily and rapidly up to about 800 °C in less than 2 min (Fig. 8). The change in the heating rate of graphite is due to the ignition of carbon and the formation of the CO/CO2 atmosphere .The addition of graphite to the EAF dust significantly improves the microwave heating of the dust, thus enabling the achievement of high temperatures in shorter times. For example, after 180 s of microwave heating, the temperature of EAF pellet increased from 756 °C to approximately 845 °C when the EAF dust was mixed with 1.1 the stoichiometric amount of graphite. The effect of temperature on the selective zinc removal from EAF dust was studied at 750 °C, 850 °C, and 950 °C with microwave power of 1.1 kW and processing time of 20 min. The compositions and the removal grade of zinc at different temperatures are presented in Table 3. At 750 °C, the chemical composition showed that the zinc content was reduced from 35.76 to 27.85 wt% (22.11% Zn removal) in the residue after microwave heating for 20 min at 1.1 kw. The Pb and alkaline elements (Na and K) contents were reduced from 2.15, 5.22 and 3.21 to 1.42, 4.22 and 2.12 wt%, respectively. The residual carbon content was 6.22 wt%. XRD indicated that the diffraction peaks of ZnO and ZnFe2O4 were still observed (Fig. 9b), whereas the peaks of ZnO were weakened. At 850 °C, the zinc was reduced from 35.76 to 13.09 wt% (63.39% Zn removal). The lead and chloride contents were completely removed from the residue. The alkaline elements (Na and K) contents were reduced from 5.22 and 3.21 to 2.04 and 1.11 wt%, respectively. The residual carbon content was 3.85 wt%. Figure 10 in which EAF pellet is presented before and after the treatment at 850 °C shows a porous structure which indicates the evaporation of zinc from the pellet after microwave heating at 850 °C. 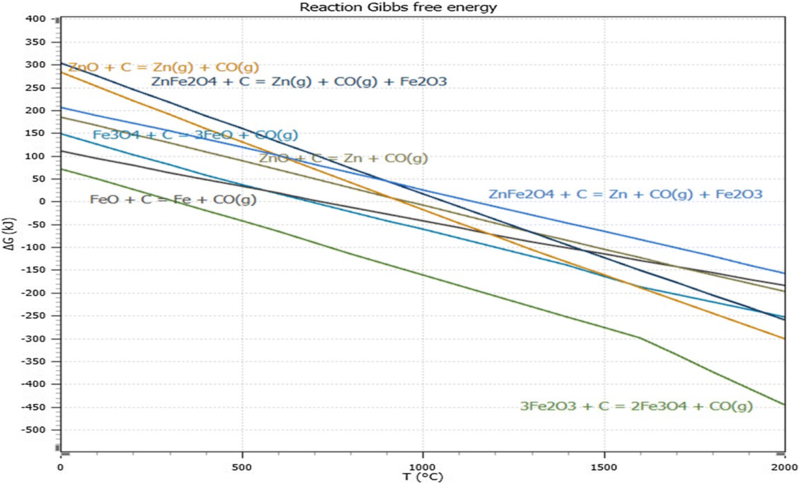 XRD showed that the peaks of ZnO phase disappeared after microwave heating, while the peaks of ZnFe2O4 were still present in the residue (Fig. 9c). The calcium ferrite and calcium silicate phases were also observed in the residues. SEM images showed that the particles were partly sintered (Fig. 11a). 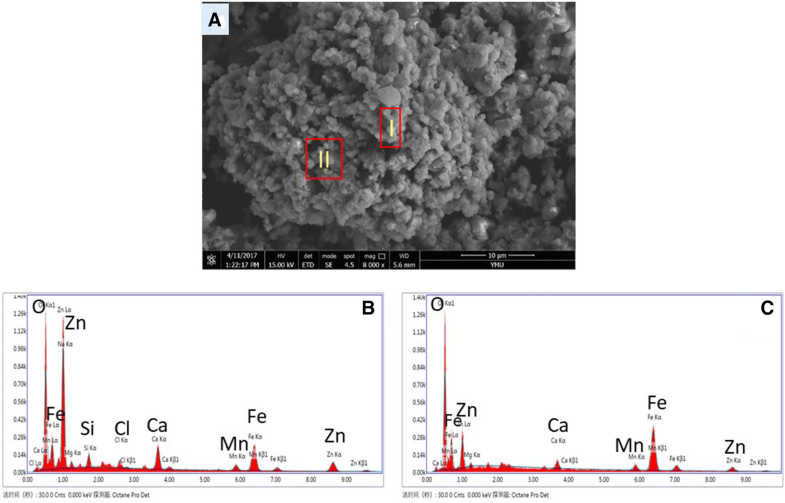 EDX analyses indicated that Zn was observed in most particles associated with calcium ferrite and calcium silicate grains (Fig. 11b, c). Calcium oxide combined with free iron oxide in the mixture to form calcium ferrite [17, 25]. At 950 °C, the zinc content was reduced from 35.76 to 2.21 wt% (93.21% Zn removal) in the residue after microwave heating for 20 min at 1.1 kW. The Na and K contents were reduced from 5.22 and 3.21 to 1.44 and 0.88 wt%, respectively. The volatile elements (Pb and Cl) were completely removed from the residue. The peaks of ZnO and ZnFe2O4 disappeared after microwave heating (Fig. 9d). Traces of ZnFe2O4 were detected in the residue. The residue composed mainly of metallic iron owing to the completely reduction of zinc ferrite. 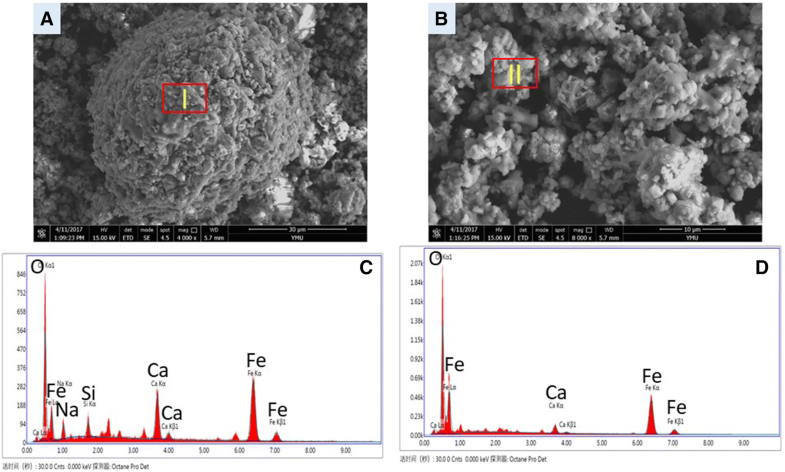 SEM images showed that the residue was rich in iron and calcium ferrite grains (Fig. 12). The particles were sintered during microwave heating. No zinc-bearing phases were detected in the residue with EDX. Different grades of zinc removal were obtained at various temperatures. In general, the reduction and the recovery of zinc increase with the rising temperatures. 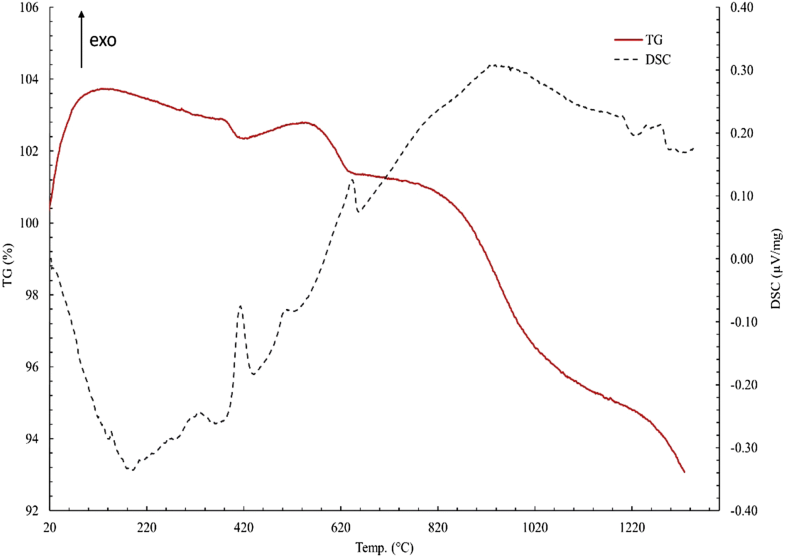 The results indicated that the temperature of 750 °C was insufficient for the volatilization of zinc [26, 27]. Increasing the temperature to 850 °C resulted in increased the zinc removal rate from 22.11 to 63.39%. Zinc removal rate of 94% was obtained at a microwave heating temperature of 950 °C. XRD revealed that after microwave heating for 20 min at 950 °C, zinc oxide was completely volatized, and zinc ferrite was reduced to metallic iron. These results indicated that a temperature of 950 °C is capable for recovering zinc from EAF dust. This is in agreement with the values presented in the thermodynamic calculations. Wu et al. indicated that the increase of the vaporization of zinc with the increasing temperature is due to that the Boudouard equilibrium shifted to the side of CO, which maintained the reduction effect of the gas. The other reason is the increasing driving force due to decreasing Gibbs free energy of the reduction of zinc ferrite and zinc oxide with increasing temperature. Hunt et al. indicated that microwave energy is accelerated the carbothermic reduction. 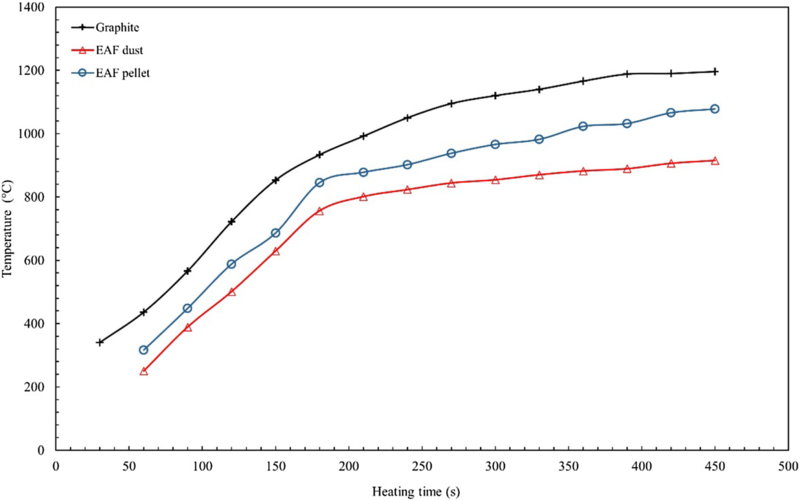 They concluded that the mechanism of microwave-induced heating has effect on the thermodynamics of the Boudouard reaction, suggests that its use may yield energy savings in driving the general class of gas–carbon reactions. Pickles et al. indicated that the efficiency of zinc removal affected with the content of calcium oxide in the EAF dust. The increase in the amount of calcium oxide resulted in a significant increase in the amount of calcium ferrite, and also a corresponding decrease in the amount of iron oxide [17, 25]. Therefore, more reducing agent was available for the ZnO/ZnFe2O4 reduction, and this results in an improved zinc removal ratio. Moreover, the results revealed that there were significant reductions in the contents of lead and alkaline elements after microwave heating. The chemical compositions of the residues indicated that the lead and chloride were almost vaporized and removed from EAF after microwave treatment. According to thermodynamic calculations , the vaporization of lead occurs with the formation of chloride since the boiling point of elemental lead is much higher than the one of zinc which can be vaporized via reduction. Owing to the lower thermodynamic stability of lead oxide in comparison with zinc oxide, high lead recoveries could be achieved at lower temperatures and reactant ratios [25, 31]. The present study examined the possibility of selective zinc removal from EAF dust by means of microwave heating. The microwave heating tests indicated that EAF dusts are good microwave absorbers owing to the contents of carbon and iron oxides. The mixture of EAF dust and graphite was well homogenized, compressed to pellets, and heated in the microwave furnace for 20 min at 1.1 kW microwave power for various temperatures. The zinc removal increased with the rising temperatures. The results indicated that a temperature of 950 °C is suitable for selective removal of zinc from EAF dust, which is in accordance with the thermodynamic calculations. Thus, at this temperature, the reduced iron remains solid, whereas the reduced zinc is in gaseous form and could be separated from the gas phase by cooling. Therefore, Zn is recovered as a valuable element, and the remaining solid residue is reused in steelmaking processes. Moreover, the results revealed that significant reductions in the contents of lead, chloride, and alkaline elements are observed after microwave heating. Open access funding provided by University of Oulu including Oulu University Hospital. The authors gratefully acknowledge the financial support of Tekes (6905/31/2016). The authors thank Ovako Imatra for supplying the industrial sample.